• How much “story-telling” can you DO in only 15-seconds? • How much animation can you DO in only 450 frames? • How many effects can you USE to light-up your video in only 15-seconds? NEW MMDers get bogged-down in trying to create too-large of a masterpiece as they start to learn to animate. LONG-TIME MMDers tend to forget the simple pleasure that MikuMikuDance can BE if you will just enjoy the process. The idea of doing only a fifteen-second animation is to give you a very attainable goal: use precisely 450 frames to create a custom animation. In that length of time… in only that many frames… you can conceive of an idea, generate a soundtrack, find some accessories, dust-off your favorite model and create an animation in less than three hours, from start to finish. … Maybe take a few more minutes to do some fine-tuning and then post it on YouTube… the WHOLE project, started after school (or after work) and uploaded to YouTube before bedtime. It doesn’t have to be (probably WON’T be) a masterpiece… but just a spot of fun at the end of your day. THE CHALLENGES on Zero-to-450.com are simple and open-ended. “Hit someone with the yellow plastic bat.”… and use the BONK! accessory if you are so inclined. Not inspired? You WILL be! So, no… you are not too excited… but you decide to do it… see what it’s about. 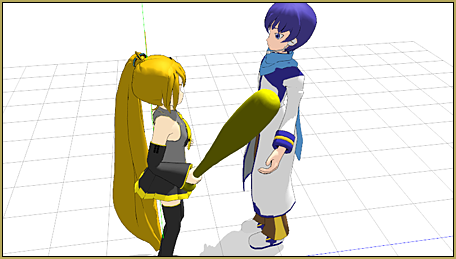 You download the plastic bat from the Zero-to-450.com Downloads page… and you load two models: Neru and Kaito. You work with Neru to get her to hold the bat. The whole scene falls into place, doesn’t it? OBVIOUSLY you are going to have Neru whack Kaito with the bat. … Okay… so… what’s the story? … You’ve only got 15-seconds so there cannot be THAT MUCH story. That’s it… time’s up! … 450 frames go by so quickly! S0…. what will you do, tomorrow? For my latest version (I have made several different attempts at this challenge) I set up a nice hug… thinking I would have Len hug Rin. I worked like a madman on that hug pose to get it just right… for like an hour!… and then I discovered that in only 15-seconds, I could not have a drama and still have enough time to show-off that nice pose I had just created. So, I dispensed with the drama and the scene opens with the hug already under way… to show it to you, I move the camera around the couple… but… BORING!… so I added a little spice by having Neru looking angrily on from the side-lines! The soundtrack was an important part… I made it go sour/powerful as we start to see Neru in the background. … DONE… all finished in about three hours from concept to posted on YouTube. You see? … You don’t need to download a bunch of stuff to have fun with MikuMikuDance… it’s all about learning how to USE MikuMikuDance… you can do it! Bite-Sized Chunks of time and effort. One of our LearnMMD Teammates, xxBodger (Russell Meakim) posted a Guitar Challenge video a few years ago. Nice work!… amazing to see! Check out Zero-to-450.com … see that they offer you the chance to “become a 3D Animation Warrior” by posting a comment, there, with a link to your 15-second video!